Devoted to all things local and sustainable, the new hotel brand is committed to taking guests to people – not just places – and unearthing the beating heart of destinations. At the core of Jean-François' designs is a desire to bring the natural environment and local Mauritian way of life to the forefront, giving every visitor a real sense of what his homeland has to offer. Taking an incredible existing geometric, riad-like building on the fringe of Palmar beach he carefully repurposed the standing structures to accentuate the hotel's proximity to the sea. 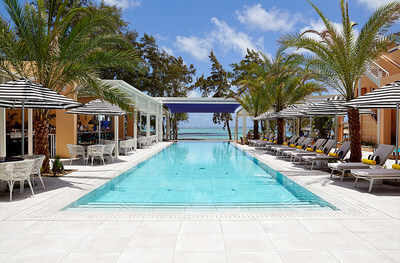 As part of this, he orientated all beds to face the water and redesigned the pool to reinforce its connection with the beach. In addition, he played to the island's warm tropical light, allowing the location's natural colours to shine. Fauna and flora have been protected throughout this project. Jean-François' explained, "Everything about the hotel is designed to bring people together. From the communal tables in the bakery, restaurant and beach bar, to Mauritius' ϔirst roof-top bar and the inviting spaces in the SALT equilibrium spa, it is all about gathering and sharing stories of travels and enjoyment of this incredible location." Camille's task was to find the perfect balance between her own creative impulse and the authentic expression of the island's character – fresh, playful and irresistibly positive in outlook. To find inspiration, she travelled around Mauritius, meeting with local artisans and absorbing the bright palette that punctuates the island; from verdant landscapes, brightly painted houses, azure seascapes and show-stopping sunsets, to the spirit of its communities and the colourful mosaic of culture that makes Mauritius so special. Walala commented, "People paint their houses in the most amazing tones that really stand out against the lush tropical setting. When choosing the colours for SALT of Palmar I wanted to try and get a balance between natural tones and bold pop colours. The space is supposed to be fun and hero the beauty of the incredible island." Detailing throughout the hotel is authentic, artisanal and unique. Local ceramicist Janine designed and crafted the hotel's tableware – a beautiful set of 950 individual pieces for SALT of Palmar; each one made entirely by hand. From $200 per double room per night on a bed and breakfast basis. For more information, visit www.saltresorts.com.